Where forest meets sea on Canada’s Pacific coastline, First Nations have sustainably used an incredible natural bounty for thousands of years. Ian McAllister of Pacific Wild wants to continue their traditions of protection. These grizzly bear cubs left their winter den only four months ago, but already their mother has taught them to swim and dig for clams. Soon they will learn to catch salmon, an essential ingredient in their winter provisioning. The white sandy beaches and rocky headlands of northern Vancouver Island disappear behind my wake. Off to the east the Great Bear Rainforest’s snow-capped peaks are silhouetted against a darkening sky. Through the salt-water mist a chain of serrated islets and islands appears. These islands form part of the southern boundary of the Great Bear on the west coast of Canada, separating two worlds. The one I’m heading towards is a lost world of kelp forests, rock, towering trees and ecological riches. South of here the forests have largely been converted to tree plantations. The paradise to the north represents more than half of Canada’s Pacific coast and much of the world’s remaining intact temperate rainforest. It constitutes more than 1,000 uninhabited islands, 2,000 river valleys hosting wild salmon, and one of the largest unexplored, unprotected marine ecosystems on the planet. I’m traversing the wide-open Hecate Basin, the body of water between Vancouver Island and Haida Gwaii and the northern coast of mainland British Columbia. It remains as inspiring, fascinating and mysterious for me as it did when I first ventured here 25 years ago as part of a research team assessing the region’s endangered river valleys. On days like today it is difficult to imagine living anywhere else. Some colleagues from Pacific Wild, the conservation group I founded with my wife, Karen, sailed with me to Vancouver Island on our 14-metre (46-foot) catamaran Habitat, a 15-hour journey from my home on Denny Island, to pick up crew and supplies. Now a stable air mass is giving us a window of reasonable weather for a few weeks of underwater and offshore exploration. By voyage end we will finish up on Denny Island, in the traditional territory of the Heiltsuk First Nation and also the location of the research field station for Pacific Wild. For more than 20 years, the staff at Pacific Wild have been working on wildlife conservation campaigns to protect this coast and today we work primarily on developing marine protected areas and large carnivore research, as well as youth education initiatives and science-based advocacy campaigns. Pacific Wild also operates and maintains a large hydrophone network coupled with remote cameras to research the underwater acoustic world. Idling alongside one of the many islands, we are visited by gangs of Steller sea lions and an occasional California sea lion. Car-sized elephant seals bask on the few pockets of gravel found in isolated coves, harbour seals bob out of the water and in each kelp bed sea otters drift on their backs. The air is filled with calls – shrieks, groans, barks, chirps, whistles. One large flock of rhinoceros auklets begins to dive, forcing the schools of silvery sand lance to the surface. Hundreds of other birds swoop towards this new activity. The water is soon black with acres of surf scoters and more keep coming in to feed. There is life simply everywhere. Although grizzly bears may give the impression of being robust and resilient, their populations are extremely vulnerable to disturbances in their habitat and food supply. 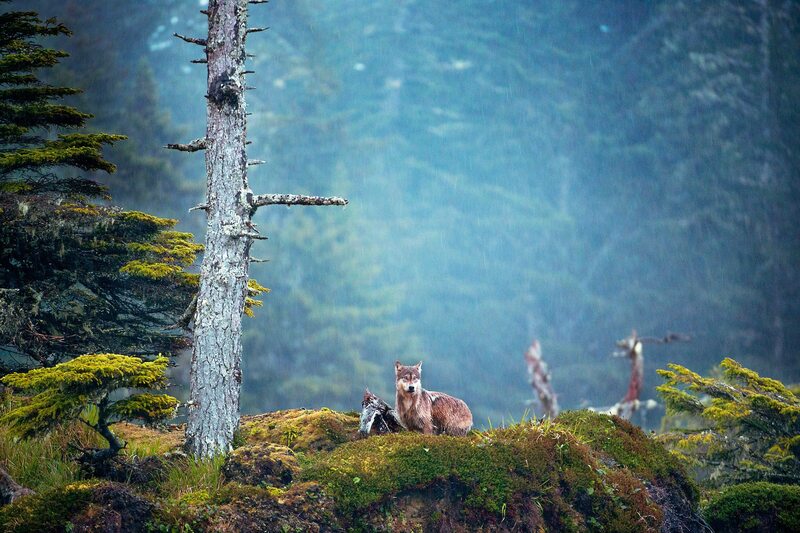 They thrive only in areas that remain relatively intact, like the Great Bear Rainforest. The connections between the ocean and rainforest along this coast are so complete that often it seems there is no differentiation between them. The rivers are constantly fuelling estuaries with nutrients and the cold-water upwelling brings an ocean of life to the intertidal zone; even the ocean air is saturated with marine nitrogen that feeds the forest itself. Bears and wolves, whales and salmon – and countless species in between – all depend on this terrestrial–marine interface. Thomas Peschak, a colleague with the Save Our Seas Foundation and an underwater photographer from South Africa, and I are getting our gear ready: scuba tanks are filled, camera housings and strobes are checked. Max Bakken, a mariner with Pacific Wild, steers us to an underwater pinnacle that rises almost to the surface, one of many underwater features we plan to explore while the weather holds. The anticipation of a new dive location never changes as we suit up and get ready to drop over the side. A mother black bear and her cubs walk across their favourite bridge, which every day takes them to the best salmon-fishing opportunities. 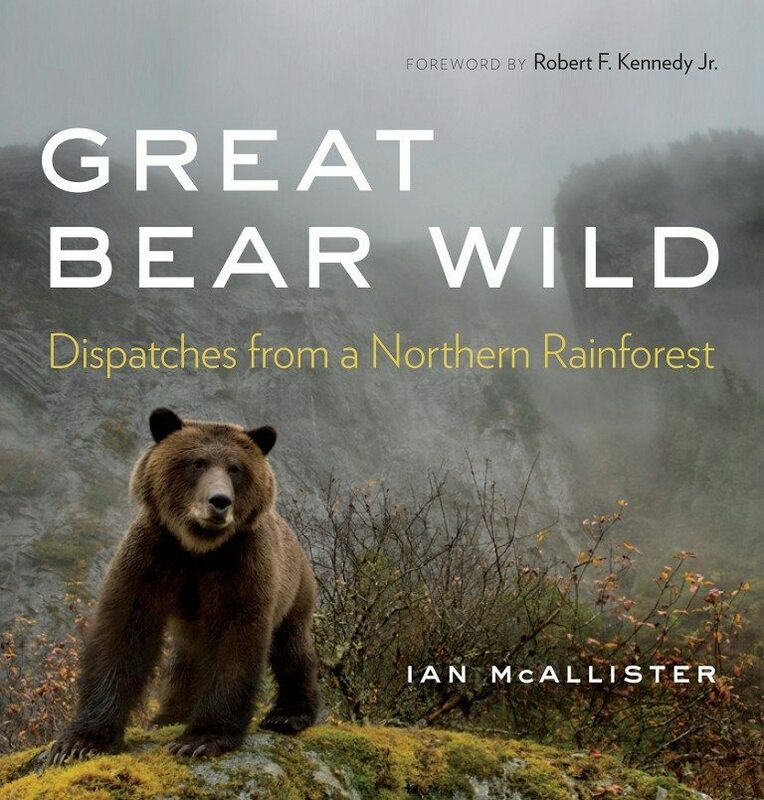 The Great Bear Rainforest is home to more than 2,000 distinct runs of wild salmon that feed a plethora of creatures from bears to birds and wolves to insects. Underwater in the Great Bear Rainforest the reef diversity changes abruptly, unlike anything on land. British Columbia has approximately 7,000 known marine species, a number that could double if we started looking seriously. The lion’s share of these, about 95%, are invertebrates, including 68 species of sea stars, 75 species of sea anemones, nearly 500 species of polychaete sea worms and more than 100 species of nudibranchs, a type of mollusc. The number of the much more celebrated vertebrate species of marine mammals, birds and fish hasn’t yet topped 600. Going slowly and focusing on this smaller world under water, I’m reminded of how globally exceptional the diversity of our marine environment is. The steep rock face has a dusting of feather stars and a few rock scallops, and a resident candy-striped shrimp scampers about in the embrace of a crimson anemone as a lumbering, teacup-sized orange nudibranch forages on soft purple coral. Off to the side, a great school of quillback and grey-black rockfish swim uphill against the surge. A large coho salmon is reward for this black bear’s patience and fine fishing technique. Bears emerge from hibernation in the spring and are known to feed on more than 50 species of plants before switching to a salmon-based diet in the fall. The substrate of broken shells in the underwater alcoves is marked by occasional orange sea pens and long strands of frondless bull kelp, weather-beaten remnants of the vast fields that occupied this exposed reef only weeks ago, before the first storms uprooted the poorly anchored ones. Now the reef is covered with hooded nudibranchs, translucent predatory sea slugs that I can watch for hours. They are beautiful and graceful as their bodies wave back and forth while their rows of stout, paddle-like feet propel them. They open half their bodies up like a sail to catch tiny unsuspecting prey as it passes by, like an aquatic Venus flytrap. Fields of them make a heavenly backdrop. Further along, massive waves of opossum shrimp ride the current and surge, sometimes so thick they black out the light from above. Move another 20 metres (65 feet) on the horizontal plane and the scene changes again. The same is true for the vertical plane: drop through a succession of atmospheres – and darker, colder water – and an incalculable new set of species, life cycles and evolutionary adaptations present themselves. Forty metres (130 feet) or so below, conventional scuba equipment reaches its limit. Below this dark frontier, undiscovered species lie waiting in the vast abyss. In the Great Bear Rainforest a mother black bear, whatever her colour, can have white or black cubs. The white bears, also known as spirit bears, carry special significance for First Nations in the region. Later in the day, after three separate dives, Thomas, my team and I sail further west. As far as five kilometres (three miles) away we can hear above the ocean surf the deep roar of a thousand Steller sea lions barricading the verdant slopes of honeycombed nesting burrows that rise into the clouds above one of the islands. I look at Thomas. We are both contemplating all that we have just observed on the dives. Thomas has dived professionally for National Geographic in most of the world’s remote oceans. ‘The best of the best, my friend,’ he says. I couldn’t agree more. As the longer days of spring loosen winter’s grip, the people of Bella Bella, Klemtu, Gitxaala and other traditional herring-spawning territories on the north coast focus on what locals call ‘herring weather’. The great diversity and plethora of wildlife in Great Bear is mirrored by the richness of its people, with whom we have worked closely. There are a dozen different First Nation groups along the Great Bear and each one has diverse and unique environments in their traditional territories. 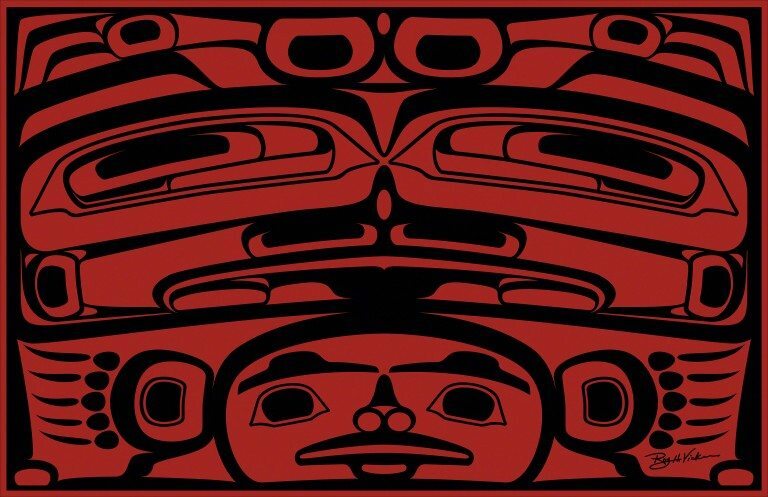 The Heiltsuk Nation is fortunate to have some of the most productive herring spawning grounds in its territory and has been at the forefront of the conservation battles to protect this endangered foundation fish species. The tides, bird and mammal life, and air and water temperature indicate much about when the herring spawn will begin. 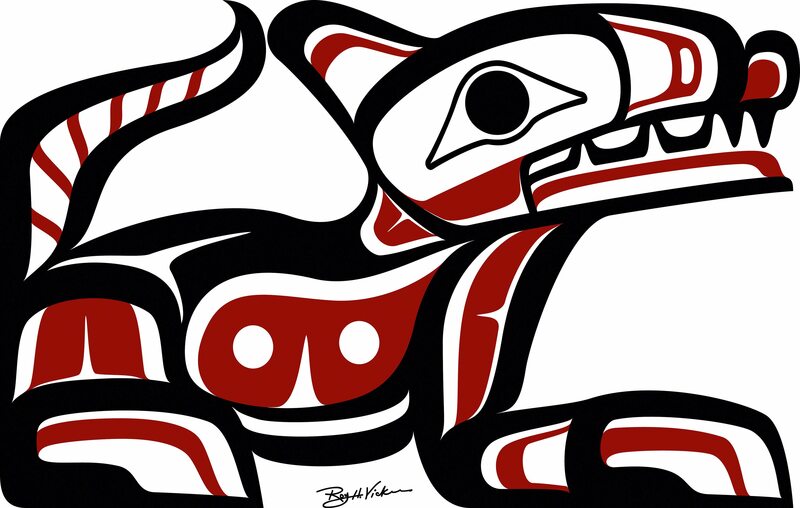 People here follow the lunar cycle closely, and in Heiltsuk culture ‘when the moon tips over’ marks the beginning of one of the greatest and rarely observed natural events on the planet. This seasonal spawning event is so important, so vital and culturally revered, it signals the beginning of the traditional Heiltsuk New Year. 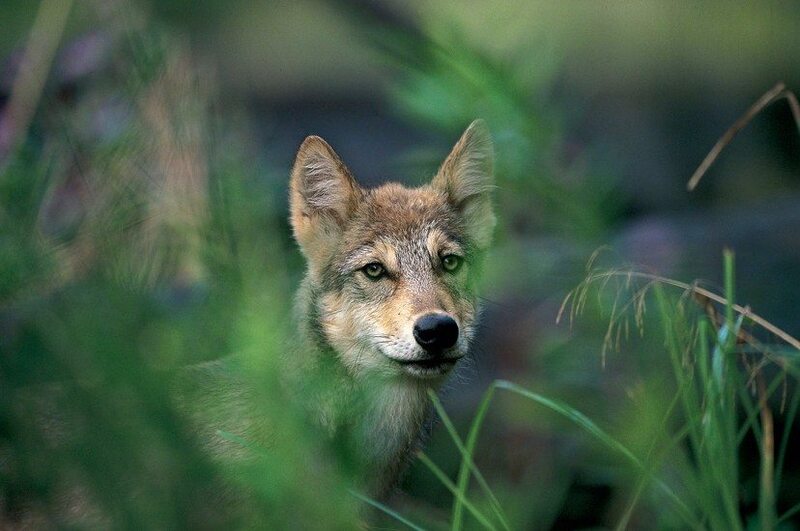 This wolf belongs to a genetically unique coastal population of wolves referred to as ‘sea wolves’, and this pup has their characteristic ochre-coloured highlights. The connection between herring and people here is older than the cedar trees; historically, herring may have been relied on more than salmon as a food source. Herring bones 6,000 years old were unearthed from a recent shoreline archaeological dig at Hakai Passage. Not long ago, researchers from Vancouver’s Simon Fraser University looked at 435,777 bone samples collected from 171 First Nation archaeological sites from Washington to Alaska – including 34 British Columbia locations – and found that herring was the dominant fish species throughout the Holocene. Most fisheries on this coast have modern equipment: monofilament lines and nets, hydraulic winches, digital sounders. There are few, if any, places that fish can escape us and our efficient, technology-driven fisheries. But one fishery remains elegant and traditional: the spawn-on-kelp, or SOK fishery. Yes, canoes have been replaced by flat-bottomed, aluminium herring punts, but in all other aspects this traditional herring-spawn fishery has operated in the exact same way for millennia. Before the spawn, fishers harvest hemlock boughs from protected groves and kelp fronds and yaga – stringy seaweed – from the more exposed outer coastal beds. In the quiet coves and channels of the traditional spawning areas the branches or seaweed are suspended from floating logs anchored to rock. The reason the herring choose these particular sites to spawn is known only to the herring themselves. First Nation families often choose multiple spawning locations to increase their odds of intercepting the spawn with their newly formed hanging gardens. The spawn is a valued resource and not all First Nation territories have such widespread herring-spawning grounds as the Heiltsuk. The monarch of the rainforest, the grizzly bear in British Columbia continues to be hunted for sport and trophy – even in parks and protected areas. 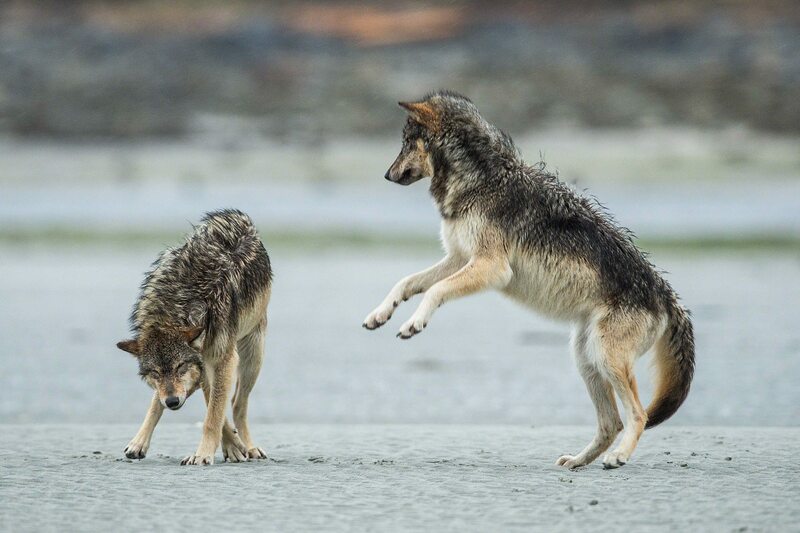 The British Columbia government also currently allows resident licensed hunters to kill wolves in the Great Bear Rainforest, with no special permit necessary. Soon after the herring schools move inshore and the ocean turns milky with milt and sperm, the females discharge their eggs, 20,000 per fish. Eventually six million eggs per square metre (about half a million eggs per square foot) will float with the tide, waiting to rest on seaweed, rock or other substrate material. One out of every ten thousand eggs will produce an adult. With luck, the logs begin to dip under the weight of multiple layers of tiny eggs building up on the hanging garden below. It is one of those calm mornings in early spring when fog hangs over the coast. The water in Seaforth Channel is covered in a thin layer of bubbles as the herring rise from the depths and expel air from their bladders. These curtains of bubbles are thought to confuse predators. As each herring expels air, a small acoustic blip can be heard like hard rain hitting the water. The late Heiltsuk elder Ed Martin told me that hunters used to carry small round pebbles in their canoes and gently toss them into the water to mimic the sound of herring; sea lions, dolphins and other prey would come inshore attracted to the familiar sound. Thousands of surf scoters rafted in large black mats are bobbing on the water’s surface, the current, wind and tide ensuring they are never in one spot for long. The males have large, distinctive bills – bright orange and white with a black gonydeal spot. They are breathtaking when they take off and gather momentum; like a wave gathering speed, the air is soon filled with the harmonic whistling of thousands of beating wings. 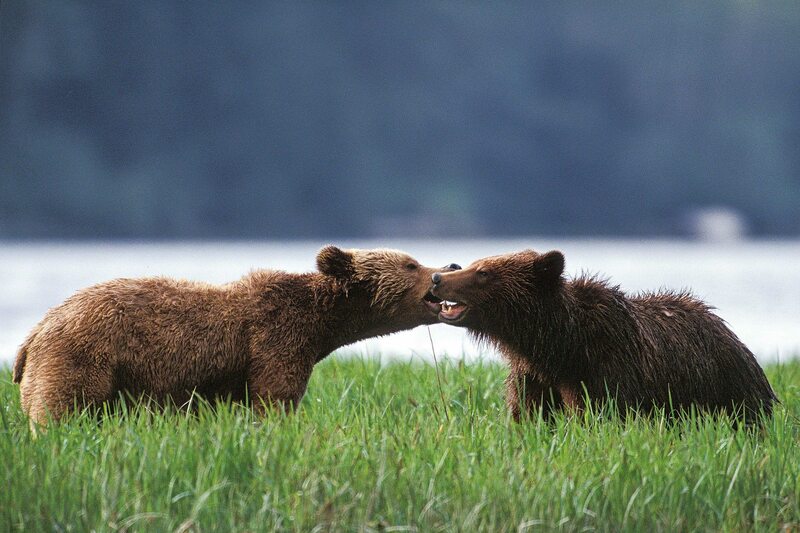 After the polar bear, the grizzly is the second-slowest reproducing land mammal in North America. This is one of the reasons that grizzly mothers are so protective of their cubs, and why habitat loss and human-caused killing have led to the extirpation of the species from large parts of North America. In a nearby cove a Heiltsuk family is leaning over the side of their herring punt, inspecting their lines. More boats are spread out along Spiller Channel. These boats travel slowly, keeping as quiet as possible. There is a dignified calmness on the herring grounds. People whisper. A paddle dropped in a boat can be loud enough to spook herring back down to the depths and ruin a potential spawn. Generally the herring remain deep down in the daytime unless they start spawning. Today, though, the shoreline is revolving with rising schools. When caught in a seine net these fish are so powerful that, working together, they can pull a 25-metre (80-foot) commercial boat over. I make my way over to three younger fishers who are out: William Housty, Jordan Wilson and Ian Reid. I watch as they methodically pull up hemlock branches, leaning far over the water. Each branch could weigh 45 kilograms (100 pounds), and they pull them into the punt deftly. Ian pauses for a bit and looks up at the beach. A wolf is walking along the point, one of the pack that has been feasting on the eggs this past week. He smiles. ‘All these worlds trying to get by in amongst ours,’ he says and continues to pull up the branches and eggs like his ancestors did before him. Jordan says the roe taste sweet and spicy. I eat a chunk of rich and fatty eggs that have fallen off the thick clumps now piled a metre (three feet) high on a blue tarp in the boat. Deep inside the catacomb of eggs I taste hemlock needles. It is the ocean and rainforest in one bite. At first the eggs taste almost acidic or bitter, but then the after-bite kicks in and spicy sweetness emerges. They are almost fruity. The eggs are a delicacy as fine as anything I have ever tried from the ocean. On shore the intertidal rockweed is exposed and covered with kilometres of shorebirds: black turnstones, spotted sandpipers, surfbirds. Chatting, chirping and low rattling and rasping sounds fill the air as they devour the herring eggs attached to the rockweed. They know the tide is rising and they have only a couple of hours to feed. Well over a thousand eagles can be seen from any vantage point, and there are countless gulls, grebes, loons, ducks, oystercatchers, terns, murrelets, murres, brants, herons, scaups and others – this avian drama is spectacular. For many of these birds this nutritious, predictable and easily accessible food source may mean the difference between nesting success and death, located as it is midway on their 10,000-kilometre (6,000-mile) – or more – migration from their wintering grounds of Mexico and Central America to the open Arctic. Finally the chatter fades as the birds go off to rest on various islets and in quiet coves, waiting for the next tide. Then the next major event unfolds as the surf scoters come inshore. These black birds with their red, webbed feet can’t go ashore, so they wait for high tide to dive for eggs, preferring the ones attached to eelgrass. I put on my dry suit and underwater gear, dive down about half a kilometre (600 yards) away from them and slowly swim and drift with the current. Schools of herring flash silver in the milky distance as I settle in about 10 metres (30 feet) of water. Soon the light dims as thousands of surf scoters begin paddling above me. I hold my breath, trying not to laugh at the comical sight. Soon birds are diving down all around me, lunging into the flowing eelgrass headfirst and, with a fast beat of their wings, propelling themselves back toward the surface, long fluorescent-green, egg-encrusted strands of eelgrass trailing in their beaks. They pull the delicate strands of eelgrass off the bottom easily, and it probably digests easily too. Errant strands float gently back down to the ocean bottom. The sheer number of diving birds reduces the sight to bubbles, floating eelgrass and guano, and the flash of black feathers, orange-red feet and bills. Out of the water, on the next low tide I see a flock of shorebirds lift off suddenly. 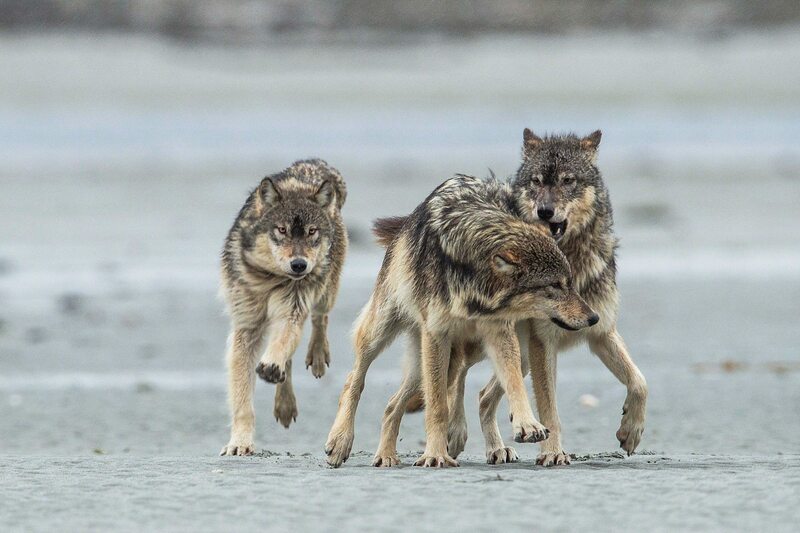 A pack of six wolves appears from the rainforest edge. They move to the shoreline and with heads down quickly begin to gorge on the herring eggs. Their intensity is born from a long winter in which food is harder to come by. A harbour seal rises through the milt with its face covered in sticky eggs. A mother orca and calf swim through soon afterwards, their backs and dorsal fins covered with a translucent sheen – to be encased in herring eggs must be comforting. For five years in a row the same black bear has shown up along this stretch of spawning ground to eat eggs. 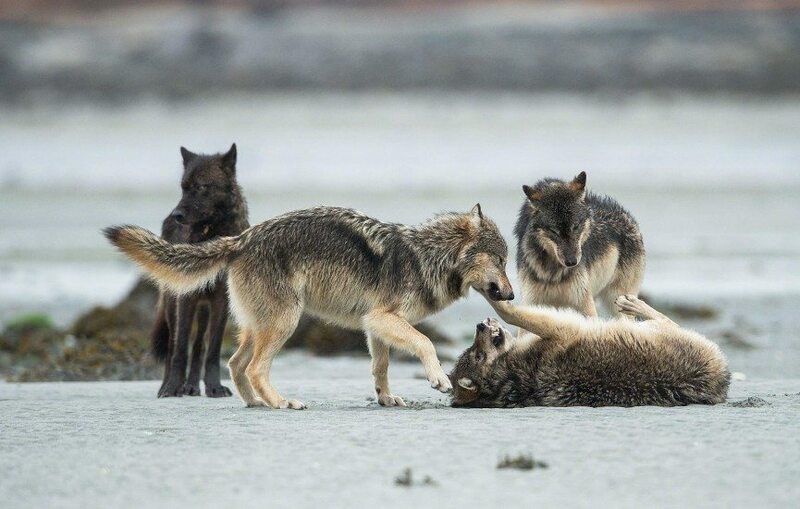 Apart from salmon season, this is the only time that wolves and bears predictably show up along the shoreline. Before long a large, brown-faced black bear emerges from the forest edge and ambles straight for the fishing spot. By the end of the day I have counted 19 individual bears. Through daily observation over the week I will count 27 in total, more than a third of them in family units, congregating at various times within 50 metres (55 yards) of this one fishing spot. Three of them are pure white. One of the most striking examples of polymorphism in the animal world, the spirit bear – or Kermode bear Ursus americanus kermodei, named after the museum curator Francis Kermode – is not an albino bear but a genetically distinct, pure-white black bear produced by a recessive gene. These bears offer a fascinating entry to the study of population and quantitative genetics, and the obvious question is: why white? What possible evolutionary advantage would there be to turning white from black in a dark, shadowy rainforest environment? According to Dr Tom Reimchen from the University of Victoria, these coastal bears diverged from their interior relatives about 360,000 years ago, probably during an ice-free refugium predating the Wisconsin glaciation about 100,000 years ago. So perhaps when the coast was dominated by snow and ice these bears evolved a colour more suited to their environment. However, another University of Victoria researcher, Dan Klinka, looked at an alternative possibility: that these bears’ colour relates to their main food source, salmon. After three seasons of research, Dan was seeing a pattern emerge: white bears were at a distinct advantage in fishing for salmon during daylight and crepuscular hours. By analysing marine-based nitrogen in hair samples at the end of a salmon season, Dan discovered that white bears appear to consume more salmon over more days than black bears do. Salmon are so important to this coast they may actually have changed the colour of a bear. Sea wolves live almost exclusively on deer and what the ocean provides, unlike wolves closer to the mainland, which have access to mountain goats, moose and beaver. 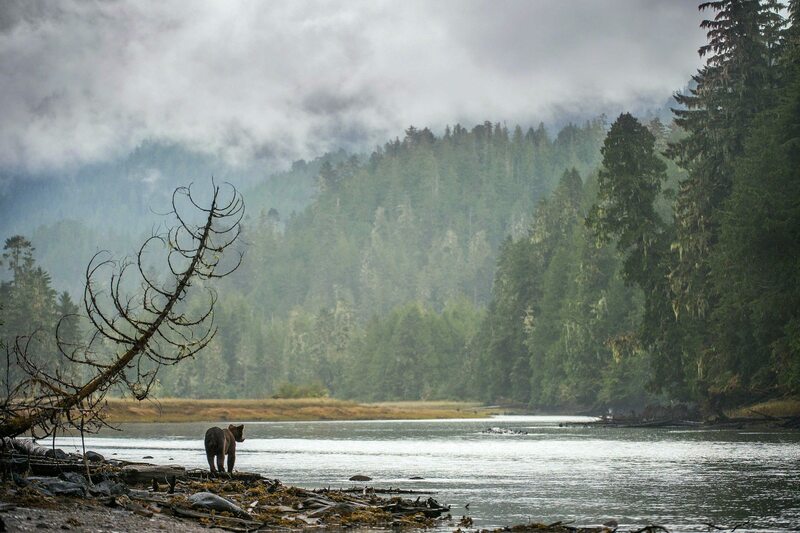 The Great Bear Rainforest and all that it represents is one of our planet’s greatest hopes to protect a globally significant coastal wilderness while respecting the indigenous rights and culture of people who have called this place home for more than 10,000 years. But this opportunity is closing quickly, unless a concerted effort is made to reverse the industrial proposals that are lining up to transform this coastal paradise. Unsustainable fishing practices are causing the decline of foundation species such as herring and salmon. 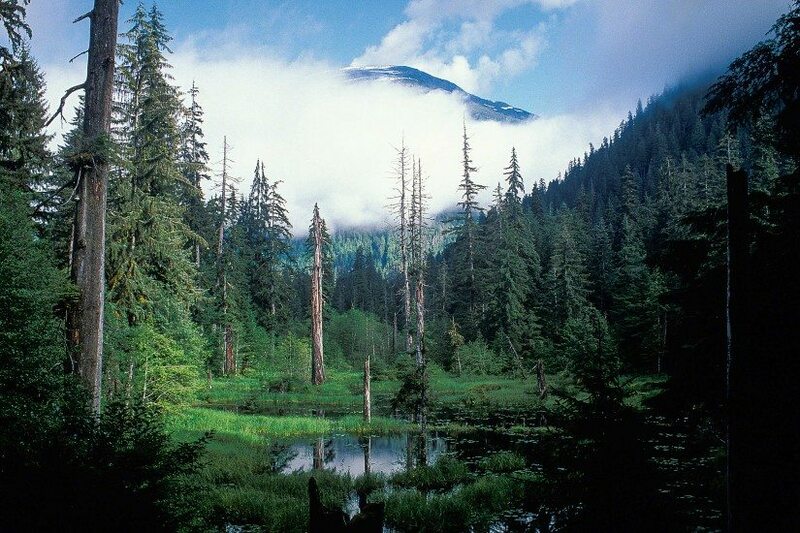 Deforestation of an irreplaceable rainforest continues to impact fish and wildlife. Energy proposals, if approved, would facilitate pipelines through the rainforest and oil tankers in our pristine waters to transport oil and gas from the interior of Canada through the Great Bear to Asia. Everything is at stake here, from the headwaters of countless salmon spawning rivers spread across the world’s largest intact temperate rainforest to the offshore reefs and deep blue water. 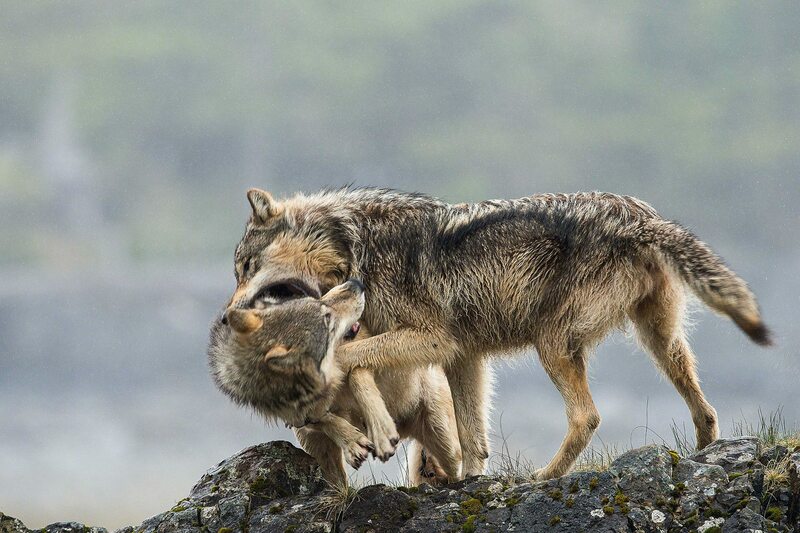 These wolves are foraging for herring eggs that are found at low tide in the spring. After the herring season, they will hunt seals and sea lions, fish for salmon and search the shoreline for beached whales and other marine mammals. But this is also a coastline of hope because of the passion and determination of British Columbians to protect it. 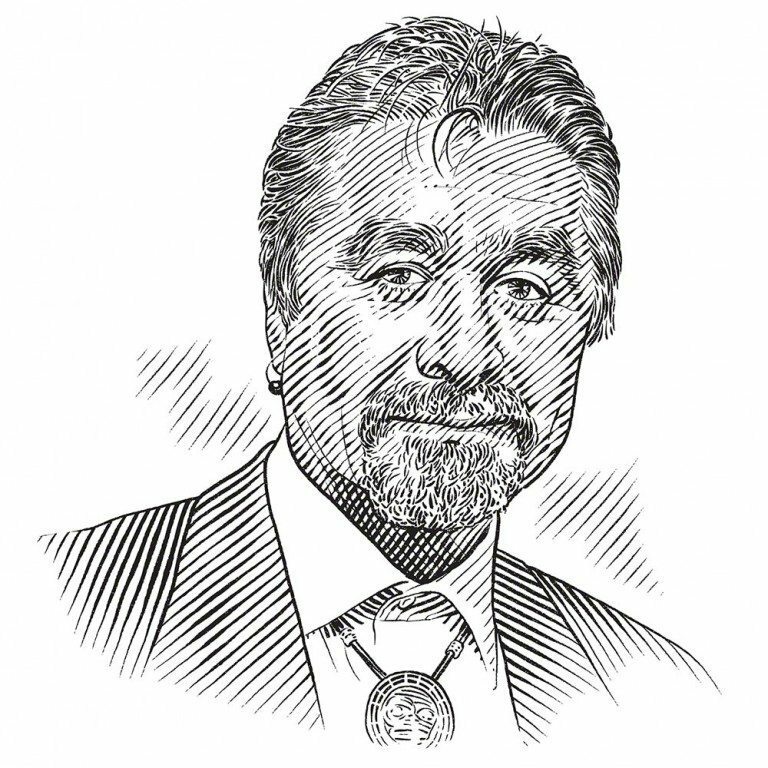 First Nations also continue to choose the environment over promises of short-term wealth offered by the proponents of pipelines and other industrial projects. Most of the hope lies in the fact that this is not a coast that tells the story of loss and what once was. The ecological structure and the species diversity are still here and our job is relatively simple and cost effective: we only have to protect them. We are not in the unenviable and nearly impossible position of having to bring back species and ecosystem function that have been lost. Canada has the longest coastline in the world and has protected less than 1% of our jurisdictional waters. There is plenty of work ahead, but the conservation opportunities for this coast are immense. Watch this full length version of the behind the scenes making of Great Bear Wild - Dispatches from a Northern Rainforest. Like First Nations on this coast, herring have had a troubled relationship with the colonial powers of the past hundred years. The herring have experienced one of the least publicised – yet tragic and unforgivable – examples of government mismanagement of a Pacific coast foundation species. 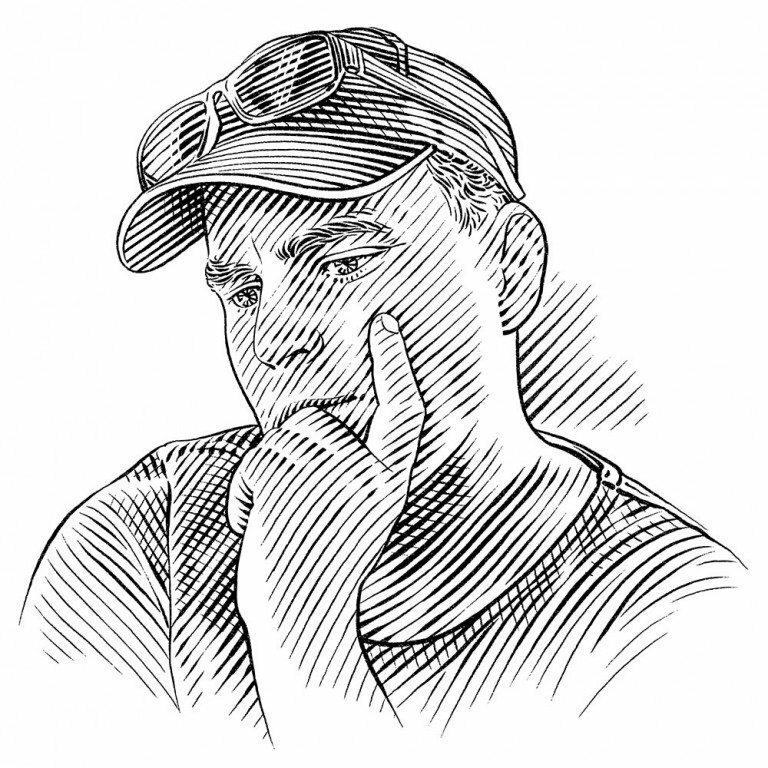 It’s difficult to understand the Department of Fisheries and Oceans (DFO). Logic would suggest that the agency would support a community-based fishery that is infinitely more sustainable than current ‘kill fisheries’, as they are known, that scoop up thousands of tons of fish just to extract the roe; the rest of the fish ends up as fish meal, cat food or bait. For a fish that can successfully spawn more than 10 times in its life, this is a barbaric end to future spawning options and a sure way to reduce genetic diversity. The herring kill fishery is an industrial insult to one of the most sensitive and important species in the North Pacific. But this has been the story of overexploiting forage fish for a long time. Sardines were the first to go in the 1940s, and when the nets turned toward herring it took only 20 years for that fishery to collapse too. As soon as the stocks begin to recover, the DFO opens the fishery again. The agency in charge of fisheries management in Canada rarely closes a fishery until the biological extinction of a stock or a species is well under way. With the herring fishery shut down in Heiltsuk territory, it is blessedly quiet compared to years past, when the arriving seine fleet would also bring Royal Canadian Mounted Police boats to keep the peace between local Heiltsuk protesters and the kill fishers. Perhaps because of this reprieve the stocks are now showing a glimmer of recovery, or at least better returns since the closure.